Yesterday I was winding down my studio session, and I painted this quick impression of a North American Whitetail buck. I see way more of these than I do people at my studio in the country. This is one of my rare wildlife paintings - maybe I'll do a few more this year. beautiful impression, i wish that was all i saw out my window! Thanks, Maria. What do you see? a whole new door may be opening for you Casey. painting our backyard is the closet to our heart. 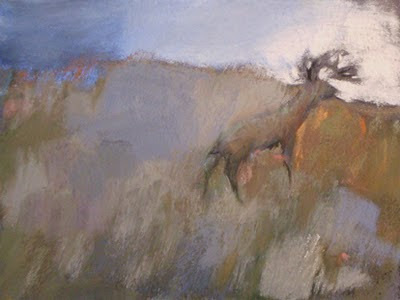 It crossed my mind to start some plein air wildlife paintings. We are a riparian hotspot, for instance. Beautiful, Casey - this feels to me like a modern-day Colorist cave painting. Hope you had a camera handy when you saw the wolf - that's a really exciting sighting. We saw one at Denali in Alaska a couple of years ago. It wasn't even on my hope-to-see list since a sighting seemed so unlikely. Camera, huh? Hey, that gives me the idea to paint it from memory, Brian. Thanks for the comment and the idea! It's very, very nice. And I usually don't like wildlife paintings at all. We get big groups of deer in our neighborhood that hang out on our suburban lawns and eat our roses and baby cherry trees. I'm the same as you, Jala. If I'm doing wildlife images, it has to be as if I've never seen a wildlife painting in my life. Deer are a very successful species, huh?